The following situational information report was originally obtained and published by Judicial Watch. (U//FOUO) The purpose of this Situational Information Report (SIR) is to alert first responders of threats to law enforcement and potential threats to the safety of the general public. The threats stem from an officer involved shooting in Baton Rouge, Louisiana on 5 July 2016. (U//FOUO) According to information forwarded to FBI New Orleans, multiple groups are calling for or planning riots and/or violence against law enforcement in Baton Rouge, Louisiana and Shreveport, Louisiana beginning Friday, 8 July 2016 and continuing through at least 10 July 2016. 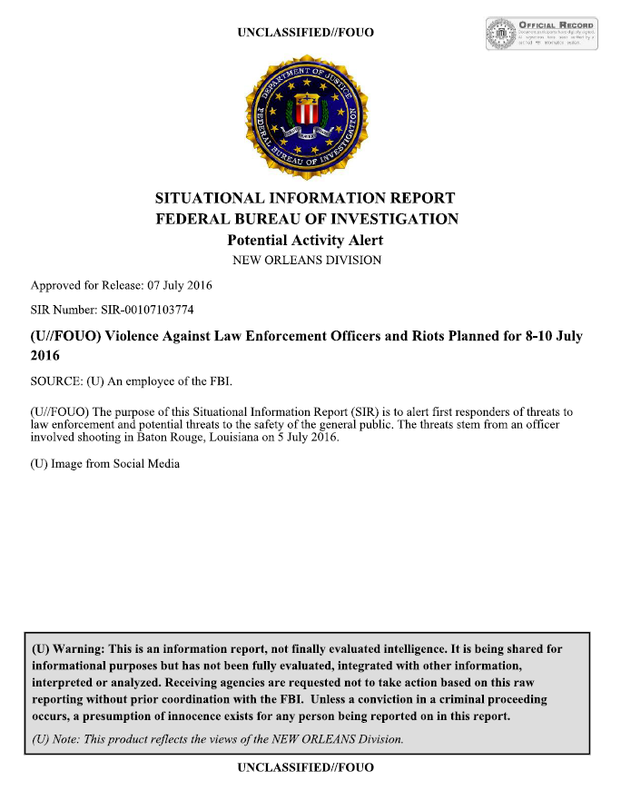 (U//FOUO) FBI New Orleans Comment: The Louisiana Fusion Center confirmed additional protests are also planned in multiple locations throughout Louisiana, but cannot confirm additional threats of violence at this time.